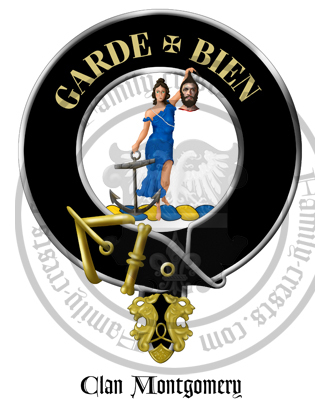 Clan Badge: A lady dressed in ancient apparel azure, holding in her dexter hand an anchor and in her sinister the head of a savage by the hair all proper. 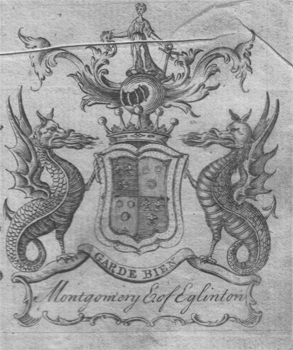 The 1764 coat of arms of the Montgomerys, Earls of Eglinton. The name Montgomery (or "Montgomerie") derives from an ancient Norman family who held the Castle St. Foy de Montgomery near Lisieux in France. Clan tradition asserts that the name can be traced to a 9th-century Viking raider called Gomeric who ventured south until he reached Normandy. He was the son of Ingvar Ragnarson, and his name meant "powerful man." Gomeric settled in the Calvados area and fortified a hilltop on which to live. This place was known as "Mont (mount) Gomeric," and within a few generations it became the family name of Montgomery. Some claim that the name can be traced back even further to a Roman commander called Gomericus. A later ancestor was Roger de Montgomerie (at the time, spelling variations included "Mont Gommeri" and "Mundegumerie"), who was related to William the Conqueror and was granted lands in England in the 11th century. He later invaded Wales and in time gave his name to a town and an entire county, Montgomeryshire. His son, also named Roger de Montgomerie, was the 1st Earl of Shrewsbury and a personal advisor of William the Conqueror. The name Montgomery is first recorded in Scotland in the 12th century, when in 1165, Robert Montgomery obtained the lands of Eaglesham in Renfrewshire. 14th Century & Anglo-Scottish border conflicts: A descendant of Robert was Sir John Montgomery who led the Clan Montgomery at the Battle of Otterburn in 1388 where the English were defeated. He was one of the heroes of the day as he distinguished himself by capturing Sir Henry Percy who was known as "the Hotspur". The Percy family paid a great ransom for the release of Henry "Hotspur" Percy and this money enabled the Clan Montgomery to build the Polnoon Castle. 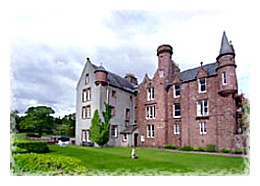 15th & 16th Century Clan Conflicts: In 1488 the Clan Montgomery burned down the Clan Cunningham's Kerelaw Castle. These two clans had a long feud. Also in 1488 the Clan Montgomery led by chief the 3rd Lord Montgomery fought at the Battle of Sauchieburn against King James III of Scotland. In 1507 the 3rd Lord was made the 1st Earl of Eglinton. During the 16th century the long running feud continued between the Clan Montgomery and the Clan Cunningham. Eglinton Castle was burned down by the Cunninghams and the Montgomery chief, 4th Earl of Eglinton was killed by the Cunninghams at the Annick Water ford in Stewarton. The government of King James VI of Scotland eventually managed to get the rival chiefs to shake hands. The 2nd Earl of Eglinton led the Clan Montgomery in support of Mary Queen of Scots at the Battle of Langside in 1568, where the Queen was defeated. The Earl was declared guilty of treason and imprisoned in Doune Castle. When the Earl, chief of Clan Montgomery was released he tried to secure the safety and toleration of Catholics in the wake of the Reformation. In 1600 the Clan MacAlister attacked the Clan Montgomery. They seized everything belonging to the Chief John Montgomery of Skelmorlie including £12,000 worth of possessons. Two years later, chief Archibald MacAlister along with Angus Og MacDonald carried out a similar attack on the inhabitants of the Isle of Bute against the Clan Stuart. A year afterwards Archibald MacAlister and Angus Og MacDonald were accused of being rebels, charged with treason and hanged in Edinburgh Tollbooth. 17th Century & Civil War: When the second Earl of Eglin, chief of Clan Montgomery was released after the battle of Langside he had tried to secure the safety and toleration of Catholics in the wake of the Reformation. Ironically his daughter Lady Margaret married Robert Seton of the Clan Seton, the 1st Earl of Winton who was a loyal Covenanter during the Civil War. Their son, Alexander Seton took his mother's maiden name of Montgomery and became the 6th Earl of Eglinton. He was a Protestant supporter of the Catholic King Charles II. He was imprisoned by General Monck for his Royalist sympathies in 1659. Another branch of the Scottish Montgomeries settled in Donegal in Ireland in 1628 and Viscount Montgomery of Alamein came from this line. At the Battle of Worcester in 1651 much of the Royalist army was under the command of Major General Montgomery who was wounded in the action. 18th Century & Jacobite Uprisings: During the Jacobite Uprisings the Clan Montgomery supported the British government. The clan chief and 9th Earl of Eglington was on the Privy Council of King William and Queen Anne of the United Kingdom. In 1715 during the first rebellion the chief of Clan Montgomery, 9th Earl was involved in training soldiers for the government. Colonial Wars: The 11th Earl and chief of Clan Montgomery raised the British 77th Foot Highlanders Regiment from members of the clan. Their exploits in the campaign against the French are legend, and it was this regiment, under General Forbes, which renamed modern Pittsburgh. General Richard Montgomery was killed in the storming of Quebec on December 31, 1775. He was the first American general to die in the Revolution. He became a symbol of all that was finest in the leaders of the American Revolution. Many of the "Montgomery" place names which dot the nation honor his memory. Arms: Azure, three fleur-de-lis or. Crest: A lady dressed in ancient apparel azure, holding in her dexter hand an anchor and in her sinister the head of a savage by the hair all proper. Skelmorlie Castle, near Largs, is the current seat of the chiefs of Clan Montgomery. A fantastic Scottish Clan Crest over the Flag of Scotland made for outdoor use from 100% polyester, in a choice of 2 sizes.